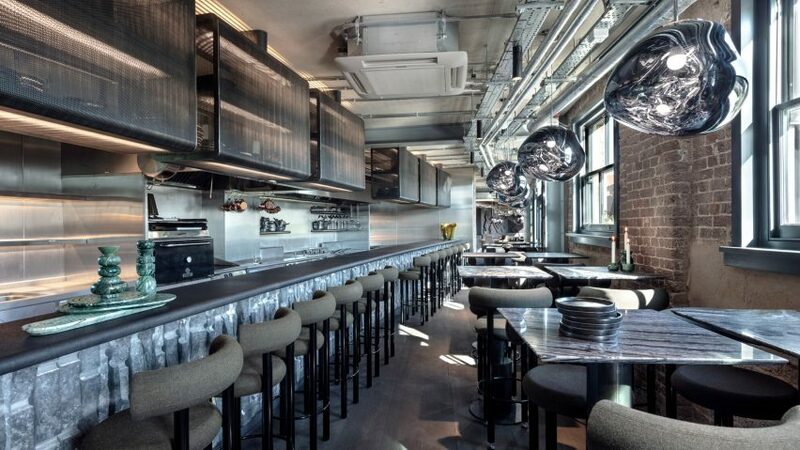 Tom Dixon has expanded his presence in London's King's Cross by opening a restaurant, which features a host of his own designs set against brick, steel and soot-hued surfaces. 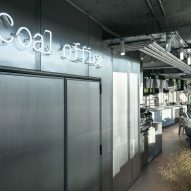 The Coal Office restaurant joins the offices, flagship store and showroom that Dixon opened inside the former coal yard's offices in King's Cross back in April of this year. 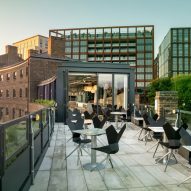 Curving round the Regent's Canal, the three-floor dining space has a bar, bakery, outdoor terraces as well as two private dining rooms. 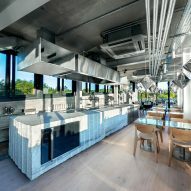 Dixon's decision to create an on-site restaurant was directly influenced by the set-up of the brand's previous premises in Ladbroke Grove, which included a European eatery called the Dock Kitchen that was used by both staff and the public. 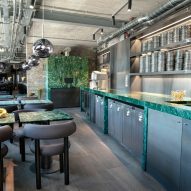 The aesthetic of the new restaurant was developed by Design Research Studio, the interiors branch of Tom Dixon, which took cues from the history of the coal yard. 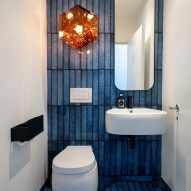 While the ground floor occupies 19th-century brick arches, the first floor has been completed with blackened timber walls and ash-grey furnishings in a subtle reference to a fire that occurred on site in the 1970s. The second floor has been made to look more contemporary with large panels of glazing and steel accents. Tables and chairs have been arranged to form what Dixon describes as a "dining playground", where guests can observe various dishes being made. "Chef Assaf Granit's idea was to deconstruct the kitchen, with cooking and prepping across three floors, and with everybody involved – from waiters to guests themselves," Dixon explained. "Each guest to Coal Office is witness to an entirely different experience – seeing it from their own unique angle or vista." Dishes will be served on crockery from Dixon's latest collections, and pieces that have not yet gone into production. 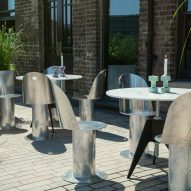 Alongside the coal yard development, this year has seen Tom Dixon open a permanent retail space in New York's Soho neighbourhood. The designer has also recently released a line of candle holders and serving platters made from Indian green marble, which were loosely inspired by the creations of hand lathe workers in Rajasthan and Agra.